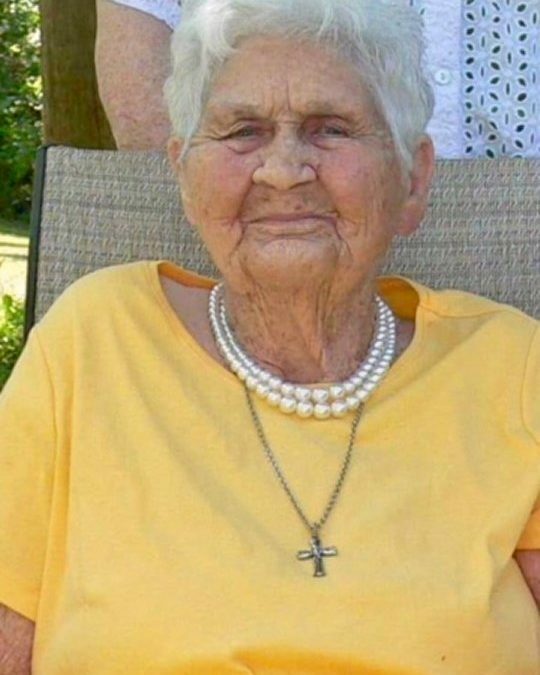 Georgia Nicholas Stout, age 90, of Burnside, Kentucky, passed from this life on Friday, August, 10, 2018 peacefully at her home. She was born on December 20, 1927 in Oolitic, Indiana, the daughter of the late Ed Nicholas and Flossie Colyer Nicholas. Georgia was the former co-owner and operator of Stout Grocery and a foster grandparent of eighteen years for Oakwood. She was a member of Grave Hill Baptist Church and she enjoyed quilting and being with her family. She also loved to travel and play Bingo. Georgia’s contagious laugh and endless love will be missed by everyone who knew and loved her. She was preceded in death by her parents; Ed and Flossie Nicholas, her husband; Clyde Stout, a brother; Cecil Nicholas, her sisters; Lorene Lewis, Ruby Bolin, Margaret Nicholas and Virginia Shelton and two great-grandchildren; Kyle Weatherford and Austin Mincey, a daughter-in-law; Tami Stout and a son-in-law; Brent Mincey. She is survived by her sons; Jim Ed Stout of Somerset, Ricky (and Lucille) Stout of Burnside, Danny Stout of Somerset and Clyde Jr. (and Peggy) Stout of Nancy, her daughters; Clyda “Sue” (and Earl) Hicks of Somerset, Lyda (and Floyd) Casada of Burnside, Mae Mincey of Burnside, Lisha Stout (and Ron) of Somerset, Cindy (and Dwayne) Sellers of Burnside, Cleda (and Charlie) Hudson of Bronston, Linda Stout of Burnside, and Tammi (and Roger) Smith of Somerset, a brother; Chester Nicholas of Danville, twenty grandchildren, twenty-nine great-grandchildren and four great-great grandchildren. Visitation will be at 4:00 p.m. on Tuesday, August 14, 2018 in the Chapel of Southern Oaks Funeral Home with funeral service at 7:00 p.m. on Tuesday at the funeral home with Bro. Troy Merrick officiating. A private burial for the family will take place at Grave Hill Cemetery. In lieu of flowers the family requests that donations be made to Grave Hill Cemetery Fund, C/O Grave Hill Baptist Church, P.O. Box 85, Tateville, KY. 42558. Southern Oaks Funeral Home is entrusted with the arrangements for Georgia Stout.